Thanks to work, family, and general life happenings, I spent most of SGAM thinking about solo gaming, rather than actually engaging in it (I squeezed in some Four Against Darkness plays, so I suppose it wasn’t a total bust.). I did manage to find some time to read through a few interesting texts, however, which have me contemplating something bigger than I’ve endeavored to undertake before: a solo campaign, complete with world building and all that jazz. Namely, continuing Vincent’s story. When you think of the Big Bang, you likely picture in your mind a black, empty space, crammed full of zilch, unfathomable nothingness, and then *snap* something like a spark occurs out of nowhere. And then *KABOOM! * a fan-tabulous explosion sends the Universe racing out, hurdling across that void in every direction and dimension, filling it up with all sorts of spectacular wonders and unimaginable horrors. That’s kind of like solo roleplaying. Something triggers your imagination — you saw it on TV, read it in a book, rolled it up on an adventure seed table (or rolled it up and smoked it), cast some story dice, read some tarot cards… you know the drill — and then one thing leads to another. Suddenly, that little spark has exploded into a full-fledged universe, just as big and fantastic as our own — even if you are only holding a speck of it in your mind for the tiniest length of time, it’s there. Maybe you can’t see it all, but it’s there, waiting to be explored. That’s why I feel like campaigning. I want to visit that universe, bear witness to Vincent’s story, and experience the whole thing, even if only a speck at a time. Scarlet Heroes, a solo RPG by Kevin Crawford, was my first read for November. In addition to being an OSR game and setting designed for 1 on 1 or solo play — complete with its own oracle system, no less — and literally bursting at the seams with random charts and tables, it also lays the foundation for 3 types of solo adventures: urban, wilderness, and dungeons. Pretty much everything you need to run a campaign, right? Dude knows what he’s talking about. Urban adventures focus more on NPC interaction, intrigue, and character conflict. Wilderness rules cover, essentially, how to hex-crawl overland, exploring as a solo player. And of course, dungeon adventures will be your chance to risk it all for untold treasures in whatever dank depths you can conjure up or randomize. 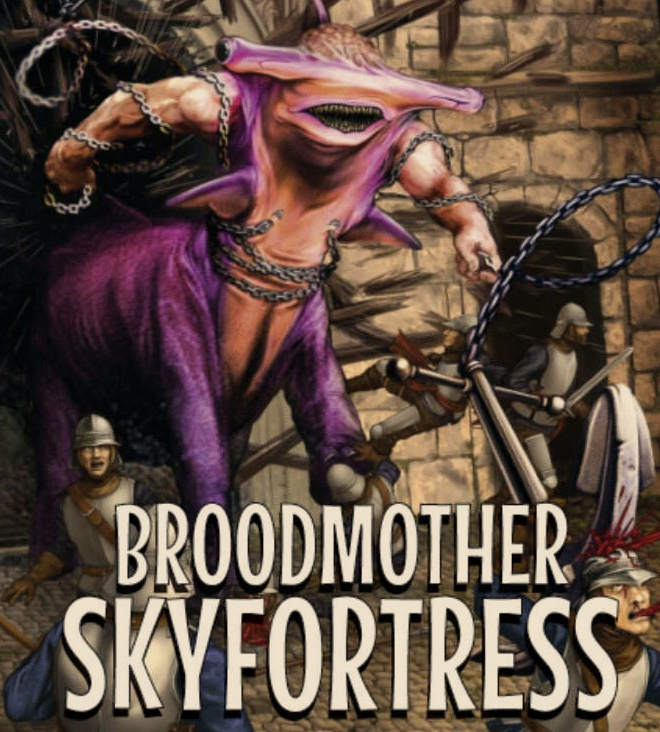 The other recent book was Broodmother Skyfortress: a [very] weird fantasy adventure for Lamentations of the Flame Princess (or probably any other OSR-style game), by Jeff Rients. 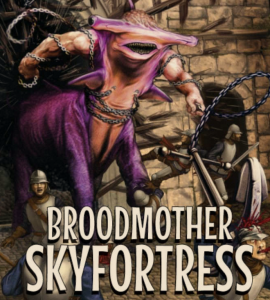 Not entirely my cup of tea, thematically speaking (spoiler: it’s a floating cloud-fortress that’s home to invincible shark-elephant hybrid giants, some of whom may or may not have breasts and lay boulder-sized eggs — it’s up to you, the GM, of course), but it’s an entertaining and educational read that will lubricate your brain for gaming. Wait, now… why the heck did I, a solo gamer, read an adventure module designed for the GM of a traditional group of 4-6 players? Well, Sophia Brandt cited it as one of the best sources of OSR GMing tips and information, which tells me that it’s going to be extremely useful as a soloist. Since I’m really GMing for myself. Kind of. Google Earth or Image search yourself a map, preferably of an island. Meet Chainmonster, just one of the lovely shark-elephant giants you’ll meat in the floating cloud-fortress. That’s all well and good, and probably a super-fast way to get a campaign up and running out of nowhere. I think you can take this approach as a solo player, too, or at least borrow some of it, as long as you don’t get too specific. Reason being, we largely depend on surprising ourselves in solitaire to derive the fun out of playing alone. That means lots of random generation of those elements listed above, to keep throwing us those curve-balls and change-ups. But it wouldn’t hurt to have some of that initial framing. Or, just take the Big Bang approach. Start with that spark of inspiration, then have your tools, choices, and imagination to work in concert to allow the universe to spring up out of it as you play. You may not have as many details floating around in your mind or on paper, but you won’t be expending any energy ahead of time to come up with stuff you may or may not find useful during play. Whichever route you take, you’ll want to have your toolkit in mind before you start: your go-to adventure seed generator, dungeon map generator (or geomorphs), location-specific monster tables, and things of that nature (maybe even go to the trouble of pre-generating some of that stuff on your lunch break so you don’t have to split your game time to do it). 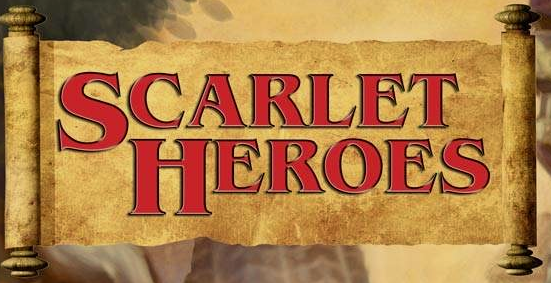 That’s where Scarlet Heroes comes in. With separate rules for urban, wilderness, and dungeon adventures, tons of OSR-styled charts and tables to roll on, and a built-in oracle for your GM emulation, it is the Swiss Army knife you might want as a boy/girl/nonbinary scout of solo campaigning. I think I may keep it more free form this go-round, and let the dice help with the word-building. I will probably stick to Sharp Swords & Sinister Spells for the core mechanics (and some more random charts), as I want to round out my previous experience that ended in only one brief combat encounter. There are so many other games I want to check out, too, though, so I think I’ll try to keep it as a brief campaign learning experience, if I can. Heck… I don’t know. I really can’t go wrong other than stressing about it (or buying more bundles…). I have to keep reminding myself this is lifelong hobby now and I needn’t rush it. Maybe this campaign attempt will slow my roll. If you read the final entry of my Rolling Solo series, you’ll recall Vincent was traipsing around the end of the world, seeking out some alien orb thingy-ma-bob at the base of an active volcano in the middle of an arctic climate, to help settle his “debt to crime lord” character complication — which I determined was actually to release his gal pal Shiriss from her debt to the leader of the thieve’s guild in a major city-state (because, listen… your significant other’s problems are your problems, too… amirite?). Exploring the soloing rules from Scarlet Heroes, I can see starting out with an “urban adventure” as Vincent returns to the city-state to ransom Shiriss away from the guild-master with the alien orb. That ought to make for some tension, at least. Then perhaps they need to flee the city, travel someplace else, “hear a rumor” about some macguffin, or what have you, that gets them kicking around outside the city walls to try out the wilderness rules. This will be a new experience for me, engaging in some “hex crawling”, which is how Scarlet Heroes’ wilderness adventures are played out (pretty excited about it!). Then, of course, to keep things short and sweet, they’ll wind up in some sort of dungeon adventure, which I’m also looking forward to trying out some new tricks and tactics from playing Four Against Darkness and reading through the above-mentioned texts. Scarlet Heroes provides for generating all sorts of aspects of a dungeon — type, size (number of rooms/locations), inhabitants, encounters, features, etc. — but does not provide a means for mapping them out, so I may employ some dungeon tiles, geomorphs, or whip out John Yorio’s pocketmod dungeon generator again. It would be fun to do something large enough to employ use of minis, though. Anyways. Stay tuned for those sorts of happenings. Footnote: Hex map in the article image was generated at DM Muse — pretty neat, tool, if you need to whip up a campaign/map in no time!